At only 5/6s the size of Rhode Island, tiny Luxembourg (pop. 400,000) delighted us with all of the things it had to offer. We went there almost on a whim (we were so close by, and when would we ever have the chance again? ), and it completely amazed us. 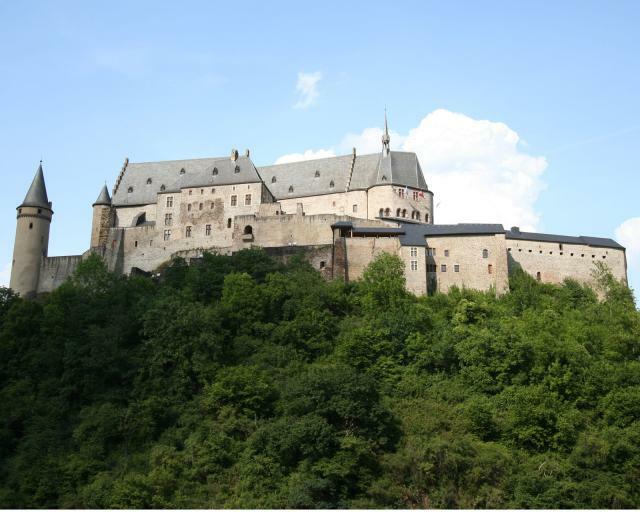 From Vianden, with its quaint streets and towering castle, to the bustling metropolis of Luxembourg City, to the green, peaceful Valley of the Seven Castles, Luxembourg has many different faces. We thoroughly enjoyed each of them, and we would highly recommend a visit to this small place. Hotel Belle-Vue (July 1-3, 2008): At about $100 a night, this place was one of the least expensive in an area full of fairly expensive lodging. The whole place was newly remodeled, and our room was comfortable and clean. We had our laundry done here, and our clothes were the cleanest and most free of wrinkles that they’ve ever been. There’s no air conditioning, though, and leaving your screenless windows open when the lights are on at night means that your room will soon be full of thousands of tiny bugs. Ours was. Hotel Victor Hugo (in Vianden): Derek loved the traditional Luxembourg meal he got here; it involved some sort of delicious concoction of ham and fava beans. Shanna’s big shrimp salad was really good, too. Picnic in Luxembroug American Cemetery: We packed a picnic lunch full of items procured at the morning market in Luxembourg City–cheese, sardines, cherries, bread and olives–and enjoyed them on a bench on the fringes of the cemetery. It was a great place to ponder the sacrifices made by all those buried in our midst.